This week, the hole/tunnel sisters decided to dig troughs deep and long enough that they could lie down in them and then get buried in sand. Not sure if you can tell, but these two guys were loping across the sand on all fours like lions, kicking up dust and having a great time. This was a really elaborate structure that involved adding water into the tubing. They spun the top in the sand so much that they drilled a hold and a flat spot on the top of the sand. Plus, when they took their hands off the rim, the top still stayed more or less upright! This little guy was so careful about balancing his ladder on this top. When he reached the peak, he declared, "king of the mountain!" His friend mostly liked pouring dry sand out of his watering can onto the mountain. Check out these awesome cherry-topped cupcakes! Speaking of elaborate constructions, there was a lot of exploration of connecting tubes, funnels and pouring sand down them today. Apparently, their invention was called a "Sand Transferer"
This was the first time I've seen a combo of pop-up tunnel plus AnjiPlay tunnel. There was some very fancy action going on with the tulle this week as well! Check out this wooden structure! mostly (interestingly) by toddlers! This little girl with the pink shirt crawled up on top and said she wanted to get down but each time her mom helped her to get started going down, she just crawled right back up! One little boy wrote out this name in blocks. I asked him if that was his name. He said, "no, it's my imaginary friend." His dad asked, "who is your imaginary friend?" "What kind of animal?" asked his mom. Otis' friend's younger brother built a "firepit." In the last half-hour or so of the program, one of the kiddos decided she wanted to build a treehouse. You can see in the photos and videos below that she has amazing leadership skills. 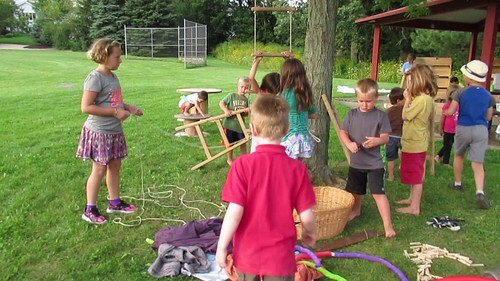 She managed to get all of these kids happily cooperating together to build this structure using complex techniques like pulleys to get larger items up into the tree. She said to one of the library staff, "I know how to get kids excited, 'cuz I'm a kid!" 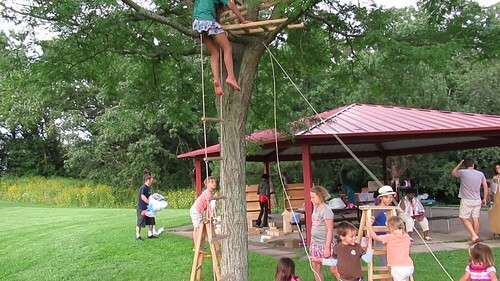 Must be true -- check out the play stories from multiple kids about their treehouse building experience! A GIANT ORANGE CLIMBING CUBE!!! Woo Hoo!!! I'll give it a separate blog post to talk about how it came into existence, but for now, can we talk about the fort they built on top of the cube? WOW it was tall! And boy did it make the grown-ups nervous. I encouraged worried adults to simply stand near enough that if a wall started to topple, they could reach out and stop it from tumbling onto someone walking below on the ground. But even I reached my own limits when the kids on top started chucking blocks from the top down onto the kids below. I stepped in and told them that was out of bounds and it felt odd to be directing their play even in that way. It made me realize that I want to work more on developing a way to get the verbal play reflections (with a group of kids) to be part of our program, so that the kids can come up with their own set of guidelines that they themselves can enforce. But once the kiddos who wanted to wage war left to go home, other kids quickly scrambled up and the nature of the play changed. And this catapult? ramp? Very fancy. Can you see how he's using a spool as a step-stool? At the east side location, the library's book bike becomes a mobile library! This is an excellent drawing of the splash pad that is part of this park! I noticed that this park had several piles of mostly-spent charcoal dumped on the ground. I love that some kids found it and decided to use it as an art supply! Play equipment can even be incorporated into a picnic table! Wild Rumpus on the News!